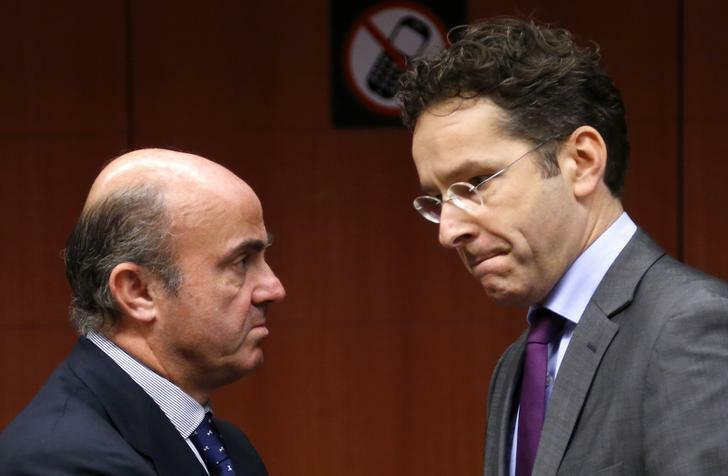 Luis de Guindos is vying with incumbent Jeroen Dijsselbloem to lead the euro zone finance chiefs. The Spanish economy minister’s Dutch counterpart has done fine, but Guindos has experience and the right nationality. Yet Spain is taking a risk by pushing his candidacy so hard. Spain's Economy Minister Luis de Guindos talks to Dutch Finance Minister and Eurogroup chairman Jeroen Dijsselbloem (R) during an eurozone finance ministers meeting in Brussels. Jeroen Dijsselbloem of the Netherlands and Spain’s Luis de Guindos are both running for president of the Eurogroup, the committee of finance ministers charged with coordinating economic policies of the euro zone. Dijsselbloem became head of the Eurogroup in January 2013 and is hoping for another two-and-a-half-year mandate. The Eurogroup’s next meeting is June 18. On June 10, Spain’s Prime Minister Mariano Rajoy said Spain has “the right” to preside over the Eurogroup due to its size. “We have a very good candidate,” he said in Brussels. Officials from the economy ministry said Spain had support from its partners and the country’s efforts in turning around the economy would be acknowledged. The IMF expects Spain’s GDP growth to reach 3.1 percent this year. German Chancellor Angela Merkel backed de Guindos as “an excellent economy minister in difficult times” during a visit to Santiago de Compostela in August last year.